Mark Twain Riverboat is an authentic paddlewheel riverboat built at a shipyard in San Pedro, California, specifically for Disneyland. Tour the Rivers of America with narration by a grizzled old river pilot with plenty of stories to tell. When Fantasmic! is running, it plays an important role in that show during the evening, but otherwise a nighttime ride can be a great cap to a day at Disneyland. Location: Straight ahead to the river as you enter Frontierland from Main Street. # of Ride Units: 1 very large boat. Open/Close: On most days Mark Twain Riverboat begins circling the Rivers of America when the park opens. On days when Fantasmic is being performed, the Mark Twain will close a couple hours before showtime. On other nights the Mark Twain will run through the evening, with the final trip beginning about 30 minutes before park closing. A sign at the loading area will list the day's last trip. Wait Times: Unless you approach just before it leaves, it is uncommon to have to wait for a second boat. A new trip departs every 20 minutes. Queue Description: Mark Twain Riverboat does not have a queue so much as a waiting area. The area is made up to look like a real riverboat loading area, with cargo deliveries sharing space on the dock. Historic United States flags are displayed in front of the waiting area. Health Restriction: None, this attraction should be safe and comfortable for all conditions. Ride Access: Access to the waiting area is through a turnstile. If you are unable to move through a turnstile go to the waiting area's exit gate for admission. The lower deck of the Mark Twain is fully accessible, but the second and third deck require climbing stairs. Wheelchair Transfer: It is not necessary to transfer from wheelchairs. Wheelchair and ECV users should be prepared, however, to board first and exit last. The reason for this is that weight of passengers lowers the boat by several inches and the boat is flush with the dock only when nearly empty of passengers. Audio: The trip around the Rivers of America is narrated. Audio assistance is not available, but audio is not necessary to enjoy the trip. Other Issues: Do not allow children to climb on the railings. Watch them near the railings on the first floor to prevent children from unexpectedly falling into the Rivers of America. 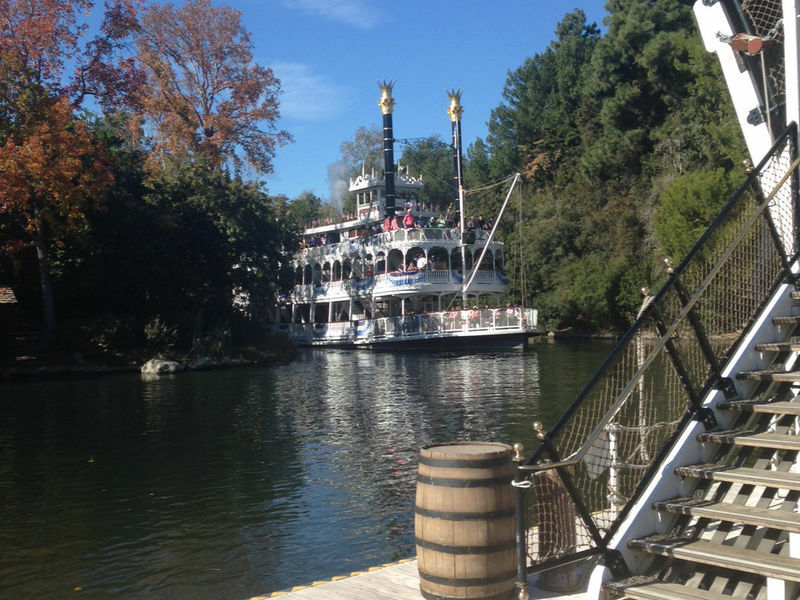 At this location: Mark Twain Riverboat has toured the Rivers of America since opening day. The Attraction's History: Built in 1954 and 1955, Mark Twain Riverboat was the first functional steamboat built in the United States for more than half a century. The decks were built on site at Disneyland while the hull was constructed as shipyards in San Pedro, California, and then transported to Disneyland. A new, more colorful, paint job was applied in 2005 for the 50th Anniversary celebration, but otherwise Mark Twain Riverboat remains pretty much unchanged 50 years later. The first trip: Several day before the park opened, the Mark Twain hosted the party for Walt and Lillian Disney's anniversary and took its first voyage around the Rivers of America. Can you drive? : It is completely up to the discretion of the boat's pilot, but if you ask nicely (knock on the door and wait for a response) you and a couple guests may be allowed to take the trip up in the pilot house.